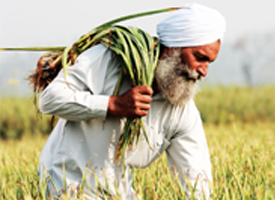 Nabha’s, and the state of Punjab’s, economy is predominantly agriculture based. Punjab has been called the grain bowl of India, producing 20% of India’s wheat and 9% of the total rice production. 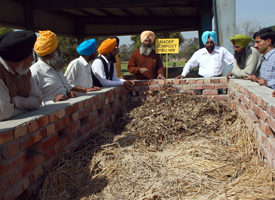 Farming practices in Nabha are characterised by small size landholdings, extensive use of agro-chemicals and indescreminate utilization of natural resources. Over time, this has reduced the biological activity of the land, causing depletion and pollution of the soil and ground-water. This, in addition to the lack of diversity in production and farmers’ inability to market their produce outside of the local “mandhi” (farmers market), constitute the major risks to social and economic base of the people of Nabha. If this situation is to improve, it is imperative that farmers modify agricultural practices, diversify and introduce more appropriate crops, as well as adopt sustainable farming methods. 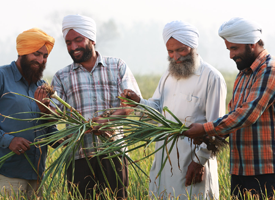 To promote solutions that work, the Nabha Foundation has established a Sustainable Agriculture Program for small and landless farmers in Nabha. The Foundation supports the conversion process, providing technical and practical training and know how on organic production, processing, certification, marketing best practices and Fairtrade standards. - Supported the formation of a Producers’ Company, owned by the farmers that unifies organic farmers of Nabha. Providing control over the commercialization of their products.